There are many different things that may be causing your hip pain, you want to make sure you are doing the best exercise for hip pain based on your symptoms. Hip pain referred or radiating from the lumbar spine, SI joint, and deep external rotators of the hip into the lateral or outside hip. May include tenderness when palpated at the lateral hip, pain on weightbearing and when side lying especially sleeping at night. The illiotibial band (fascia as above) running along the lateral side of the thigh is generally tight and should be stretched to decrease the stresses on the bursa in the hip joint. This article will describe ways to do an iliotibial band stretch, and using a foam roller to do a self massage release of the muscle. Hip Abductor Exercise to strengthen the muscles of the hip joint. This can be in standing or side lying leg lifts. Begin this hip exercise lying on your side with hips and shoulders stacked, head can be resting down or propped up as shown. Inhale as you extend or reach your top leg towards the sky and then exhale as you slowly lower the leg or pull it back down flexing your foot and pushing your heel away. Repeat for 8-12 repetitions on each side. See more of my lying side kick exercises from this page. Prone(stomach) leg extensions to strengthen the gluteal muscles. Lying face down (as shown), engage the abdominal muscles, pulling them up and in. Begin by extending or lengthening one leg off the mat at a time with an inhale and exhale as you slowly lower the leg. Repeat on each side for 8-12 repetitions keeping your abdominals engaged throughout. The piriformis is a muscle in the buttocks that, when it tightens, traps and/or presses against the sciatic nerve causing pain. Internal rotation of the hip will be restricted and painful, as well as sitting and standing for periods of time. 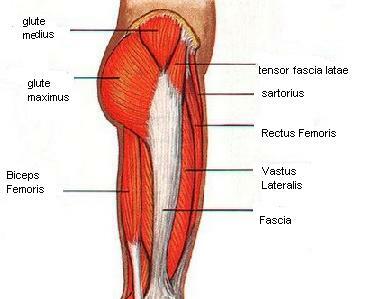 Decreased hip mobility and radiating pain going down the leg, possibly into the calf muscle. Such as the piriformis stretch exercise for hip pain shown here. Sitting on the floor or in a chair. Cross one leg or ankle over the other thigh. Gently press on the thigh as you rotate your body toward the stretching leg with an inhale. Stay there and exhale. Repeat for a few repetitions breathing in and out as you stretch the hip muscles. 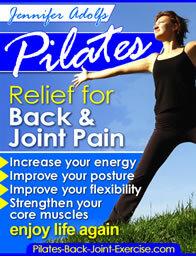 Find more exercise for hip pain and other helpful hip joint articles here.